I`m trying to source a tach guage cluster with km/h. This seems to be unobtainium in my part of the world. Sweden. 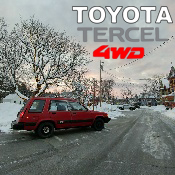 I`ve only ever seen 1 swedish tercel with a tach so it must have been a rare option in sweden. Swedish and finnish junkyards are fairly well indexed and i havent found any. I can find sprinter carib versions online in russia and japan but so far my google translated purchasing requests have been fruitless . Does anyone have or know where to find a km/h tacho cluster? I have one from an 87 that has mph and kph. Lmk if you are interested for whatever you can pay plus shipping to Sweden. the USDM version of this will work except the odometer would record miles, not km. seems there are plenty to find in the USA. to get one with the mail speedo in Km, and the odo in Km, you would have to find one from Europe or perhaps Australia, if not japan itself. Canadian car will work. I have one but it's spoken for. I'm sure one of the Canadian Forum members can track one down for you as long as you don't mind it reading 340,000 Kilometres plus. Swaping the drum is a great idea, didnt know that would work. So I take it they fit between non tach and tach clusters without any modification other than dissasembly and reassembly? Last edited by Folian on Mon Nov 26, 2018 12:11 pm, edited 1 time in total.